A couple of days ago I wrote that Katy, one of my internet friends, sent me a whole pile of needle threaders after I complained about having to sink the thread ends on some huge quilts. One of the comments to that post asked, "what do you mean by sinking the thread ends, and how does a needle threader help?" 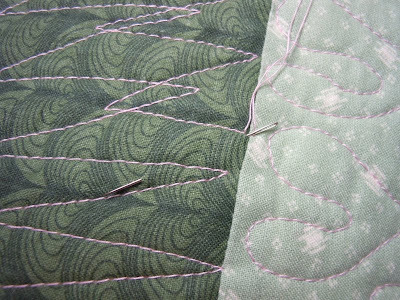 If you have begun or ended a line of machine stitching in the middle of your quilt, you have to deal with the two thread ends. Some people backstitch to secure the threads, or perhaps use very tiny stitches as they get to the end of the line, then cut the thread ends off right there. But I have seen too many such finishes that don't look finished at all. 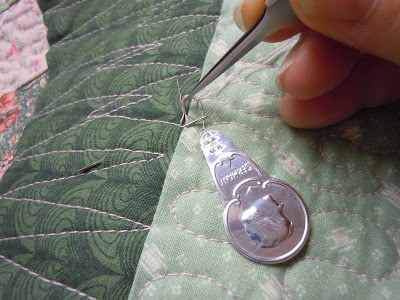 The scissors can't reach exactly to the surface of the quilt, so the thread ends stick up in little eyelashes. 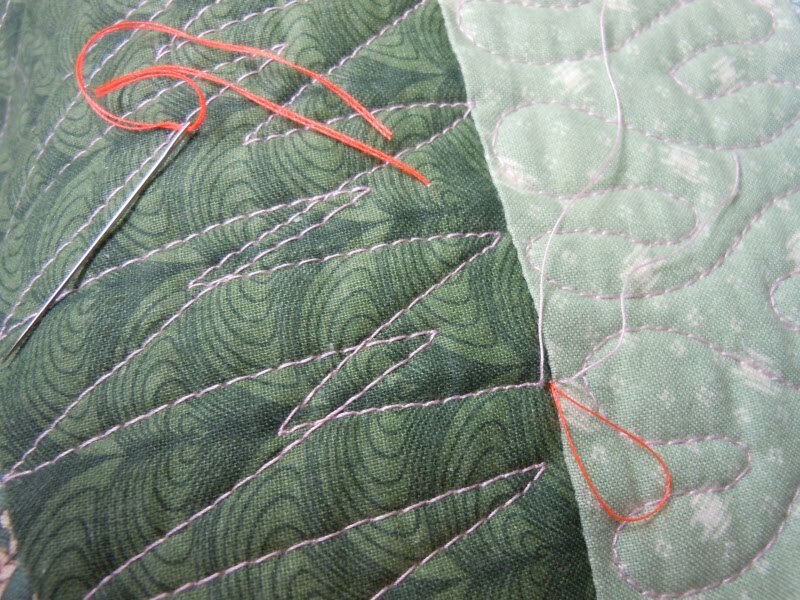 Or the backstitch didn't really secure the threads, so over time the quilting comes unsewed. 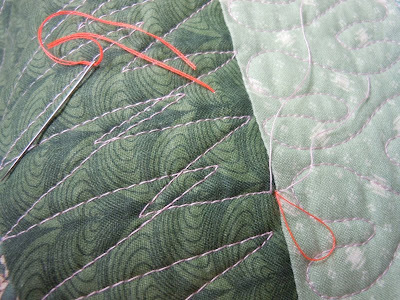 I think it's much more professional to pull both ends to either the front or back of the quilt, tie them, thread them into a needle and make the threads disappear between the layers of the quilt. This is time-consuming, of course, even if your eyes are good enough to thread a needle without difficulty (mine aren't). 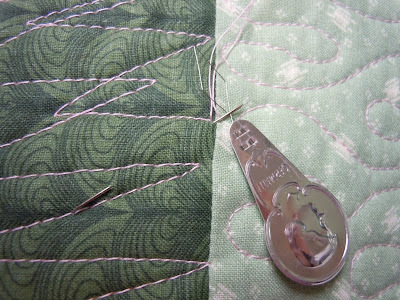 I have used self-threading needles but they tend to shred rayon or shiny polyester thread. It's much easier to just use a needle threader. I should give a shout-out to Robbi Joy Eklow, another Quiltart list maven, who champions an alternative method of sinking thread ends. It really works, and I have used it on occasion but not enough to really get into the rhythm and internalize the method. I'll show you how it works (wish I could send you to Robbi's website, but I can't find this anywhere publicly posted) but as for me, I'm just so happy with all the needle threaders that Katy sent me last year, I'll probably stick with my own method forever. 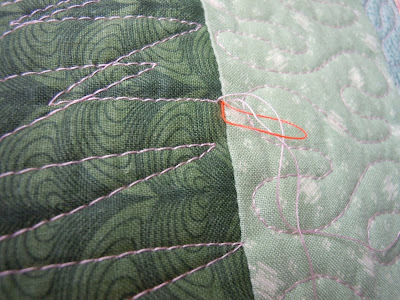 step 1: Insert a needle into the quilt exactly where you want your thread ends to disappear. 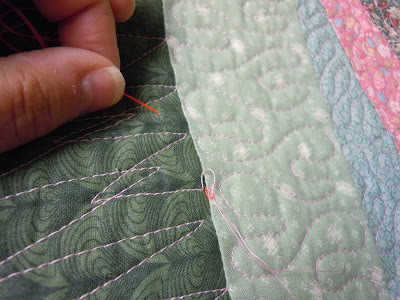 Run the needle between the layers of the quilt for about an inch, feeling from underneath to make sure the needle doesn't poke through on the back. Bring the needle up to the top of the quilt. step 2: Pop the needle threader through the eye of the needle. Arrange the thread ends underneath the wires of the needle threader. 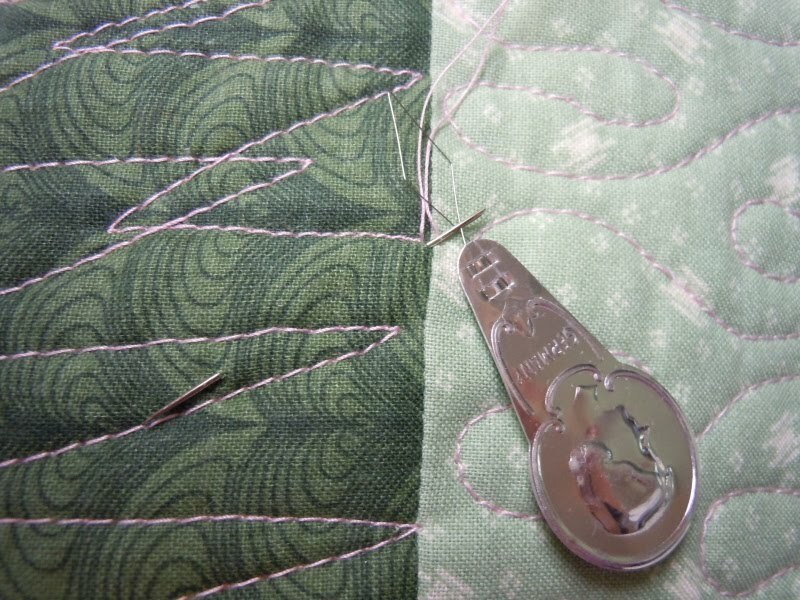 step 3: Using a tweezer, grab the thread ends and pull them up through the wires of the needle threader. Pull on the needle threader to get the thread ends through the eye of the needle. Pull the needle through the quilt to sink the thread ends. Clip off the thread ends where they emerge from the top of the quilt. You will cleverly notice that you could have threaded the needle before you ran it between the layers of the quilt. Yes, but what if your thread ends weren't long enough? We always try to leave plenty of thread when we start or stop, but sometimes things happen. This way you can pull the thread ends through the needle even if they're only a half-inch long. step 1: Cut a piece of thread about a foot long. Robbi suggests orange so you can keep that threaded needle in your pincushion forever and find it easily the next time you need to sink thread ends. Double the thread and thread both ends through the needle. Adjust the length of the ends so the loop is longer than the cut ends. step 2: Insert the needle exactly at the point where you want your thread ends to disappear. 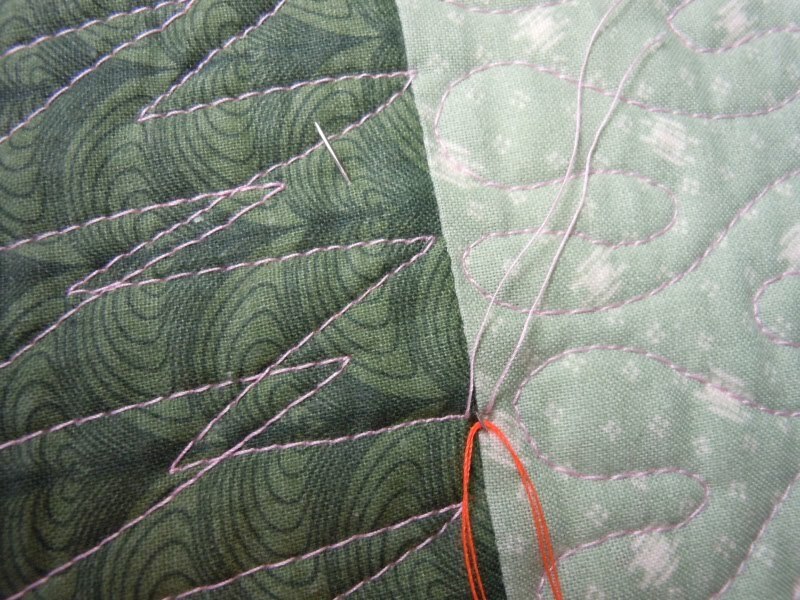 Run the needle through the layers of the quilt, feeling underneath to make sure the needle does not poke through on the bottom. Bring the needle up about an inch away. step 3: Pull the thread through until only a small loop is left. 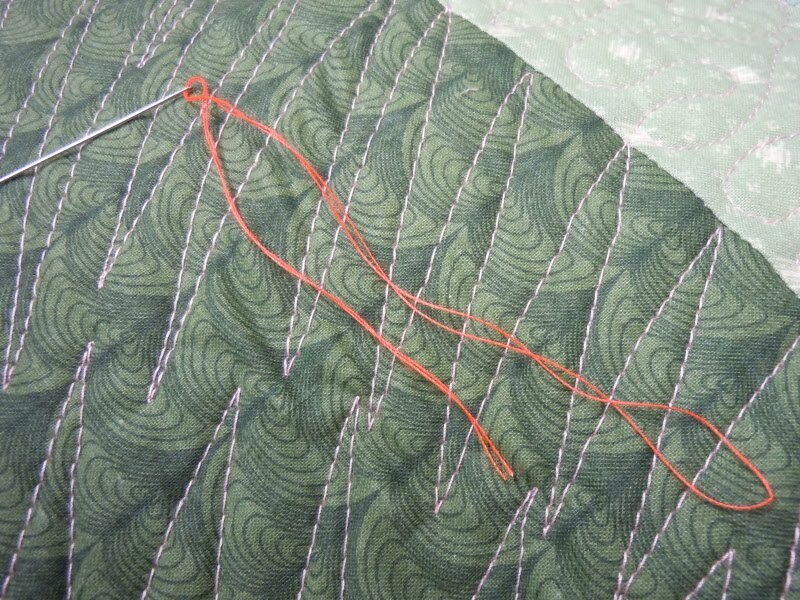 step 4: Pull the thread ends through the orange loop. 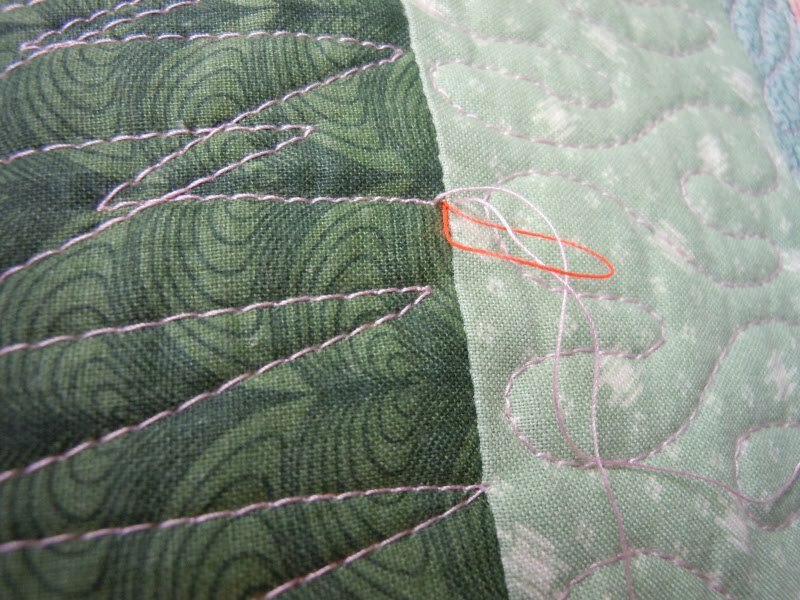 step 5: Pull the orange thread, which will carry the thread ends through the layers of the quilt. 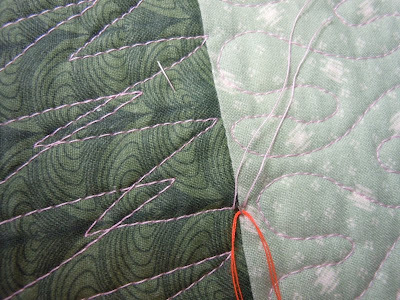 Trim off the thread ends where they emerge from the top of the quilt. Grace Howe of Red Barn Studios has created a video tutorial of Robbi's technique for catching thread tails when burying threads. I have limited internet access at present and can't pinpoint a direct link but you can view the video HERE. Light bulb moment! Thanks so much. I have been using those pesky self-threading needles which do tend to fray. Brilliant! Thanks for the tip...I'll definately try both ways as I've not been happy with my endings. Thx SO much! 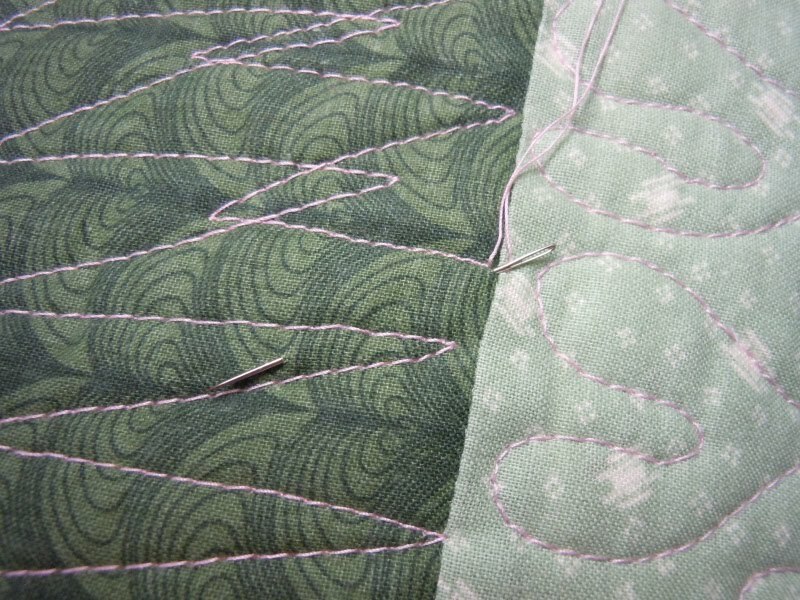 I'm just about to begin a commissioned donation quilt, and I had it in my mind to make sure I hid those threads ends correctly. Kathy....I love this, but did not read anything about knotting the thread first. Can you skip this step? Barbara -- I don't knot the thread ends, although if you are planning to subject the quilt to wear and tear, and/or if the threads are slippery rayon or poly, and/or if you plan to wash the quilt, it might be more secure to knot first. If you do, tug on the thread ends to pop the knot under the surface of the quilt rather than sitting on top.